How do you disable your chrome extensions, temporarily, then re-enable them? With an extension of course! I personally have a lot of chrome extensions enabled but from time to time need to disable them all. However, I also need to be able to re-enable them and I don’t want to go one by one and click check-boxes. I just want to be able to temporarily turn off my chrome extensions with one click and then when I’m ready to turn them all back on, click again. I found some decent extensions available, but not an exact fit. So, I scratched my own itch and made a new chrome extension that disables all chrome extensions with one click and, even better, remembers which extensions where previously enabled and will re-enable them again with just one click. Re-enabling only previously disabled extensions was key for me, because I have some extensions installed that I toggle on and off individually from time to time and after temporarily disabling extensions I don’t want to simply turn on all chrome extensions, I want to just turn on previously disabled extensions. All songs on this list were hand picked. During the dance portions of our wedding reception there were additional songs played, however these are the official songs. This playlist will always remind us of our wonderful day. For those of you who celebrated with us, thank you again! For those of you who are searching for wedding songs to add to your playlist, we think there are some great gems on this playlist that we didn’t find on other websites that list wedding songs. Waltz Across Texas by Willie Nelson was an easy pick as our first dance, being Texans, however if you need a different wedding waltz we’d suggest: Irish Waltz (our Father/Bride & Mother/Groom dance song) or maybe Come Away With Me by Norah Jones (a little too slow for us) or Could I Have This Dance by Anne Murray (our last dance). 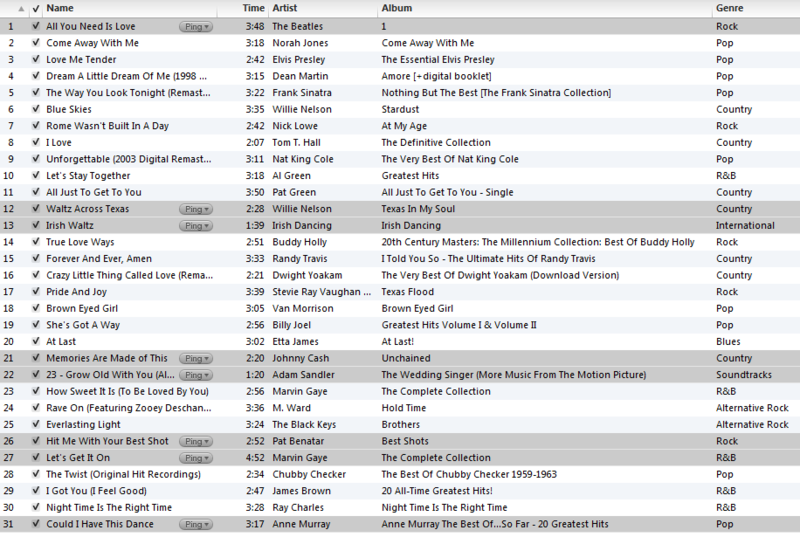 I’m a huge Beatles fan, so All You Need Is Love was perfect for our Bride & Groom Reception Introduction Song. Being fans of The Wedding Singer Movie, we had Grow Old With You played during our cake cutting. For the bouquet toss Hit Me With Your Best Shot played while the ladies got their elbows out. I selected Let’s Get It On for the Garter Toss, which set the mood perfectly for a good show! Johnny Cash’s version of Memories Are Made Of This was a nice touch for the Anniversary Dance. I created a very simple Chrome extension, jsFiddle Player, that allows you to save the combined CSS, JS & HTML output of a jsFiddle. I personally wanted an easy way to download the resulting rendered web page. jsFiddle is a great tool, hopefully you find jsFiddle Player to be a helpful Chrome extension. Cite Marker is a Chrome browser extension that puts a twist on browser bookmarking. When bookmarking a web page if you’re trying to save a reference back to a quote or snippet, more so than the entire content of a page, then Cite Marker can help. Built in browser bookmarking uses the web page’s generic title to identify the page being bookmarked. Cite Marker uses the text you highlight instead. And yes, you could type in your own title for the bookmark, if you’ve got nothing better to do with your time and would rather paraphrase the content that you find valuable enough to bookmark. Also, by using the text you highlight to mark the source your bookmarks become a lot easier to retrieve, especially if you use the bookmark search feature. You can also create multiple marks for the same page. It’ll even let you tweet out what you’re marking, if you’re into that kind of thing.